Plane table survey: earthwork at Maiden Castle. 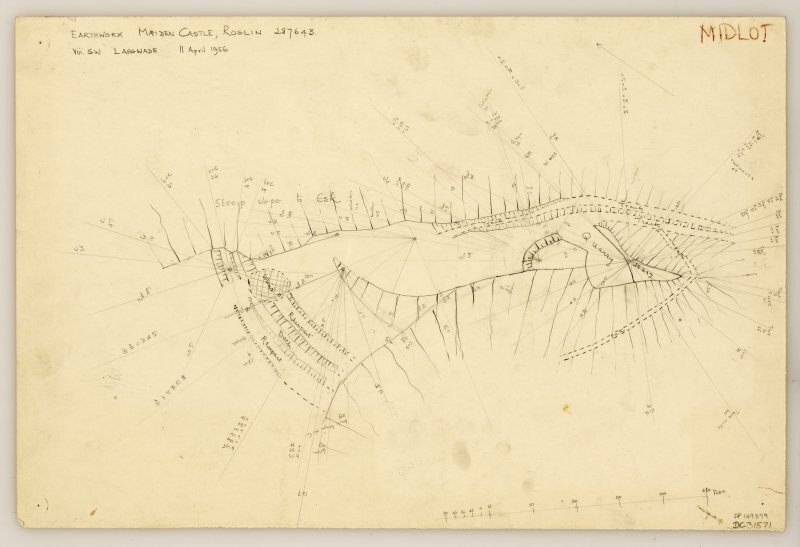 Inked plan (draft): Maiden Castle earthwork. The Maiden Castle: This site is suggestive of a motte and bailey, but, although slight traces of defensive work can still be faintly discerned, they are now so much scattered and broken that no precise details of the construction can now be obtained. No indications of the line of approach were observed on the narrow neck of the promontory on the N, and a cutting on the NE leading to the river is probably of later date. 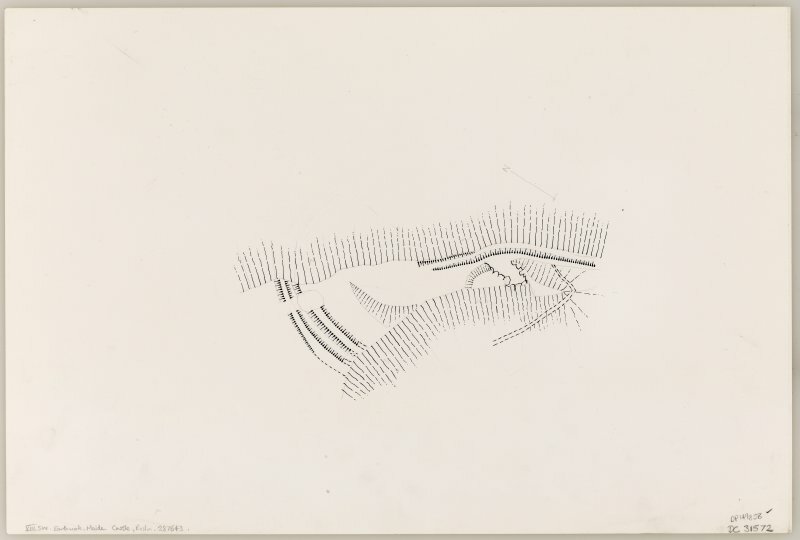 This promontory comprises two main areas: 'A', a large plateau with slight undulations, but no visible trace of foundations; and 'B', and elongated spur, much broken, also with no trace of foundations. A ditch-like entrenchment cuts off the spur from the plateau. It is formed by the natural scarp of the spur and a partly artificial bank in front (W). It may form part of the defensive works, but this is not certain as the whole area is too much broken, and covered in vegetation. This would be an ideal situation for a castle or keep, and the NSA (1845) states "Nothing now remains of this fortress but parts of the foundation, which are still visible in some parts," supporting the theory that such a building existed here. Earthwork, Maiden Castle: This spur has been fortified at some time in the past, the remains of two ramparts and a medial ditch being visible running on a slight curve across the level ground at the NW end. Both ramparts were evidently of massive proportions but have been heavily reduced by later cultivation. Where best preserved, the inner rampart stands to a height of 1ft above the interior ground surface and 6ft above the present bottom of the ditch, while the outer rampart measures up to 1 1/2ft in height internally and 5 1/2ft in height externally. The ditch has had an effective width of about 25ft. A gap near the N end of the outer rampart may represent the original entrance, but the point cannot be established as the stretch of inner rampart opposite this gap is masked by a dense growth of whins. No traces can be seen of any corresponding defences at the SE end of the spur where, however, the ground has been much disturbed by tracks and quarrying. The surface of the spur is covered with rough pasture and whins. A ditch and outer bank (with possible traces of an inner bank) are visible for a distance of about 12m across the NW approach to a steep-sided promontory, thereafter the probable line of these defences is obscured by vegetation. No other defences are visible elsewhere on the promontory. The date and purpose of this earthwork are unknown. This small fortification occupies a promontory formed in a particularly extreme meander of the River North-esk, which has created a long spur low down within the gorge. While the SW flank of the spur is simply steep, the NE flank is precipitous, dropping some 20m to the river, and thus lending itself to fortification by the simple expedient of drawing twin ramparts with a medial ditch across the neck on the NW. The outer rampart is presently the more substantial, still standing 1.7m high externally, and though the inner is no more than 0.3m in height, it stands 1.8m above the bottom of the ditch, which is some 7.5m in breadth. There is a possible entrance towards the NE end of the defences, though this gap may be where a hollowed trackway that can be seen mounting the SE end of the promontory passed on up the spur. No trace of any defences can be seen at the SE end, where, apart from the trackway, a quarry has been excavated across the spine of the promontory. The interior, which is otherwise featureless, measures about 135m in length and ranges in breadth from 45m at the NW end to 22m in the central sector, before tapering to a point beyond the quarry on the SE (0.25ha).